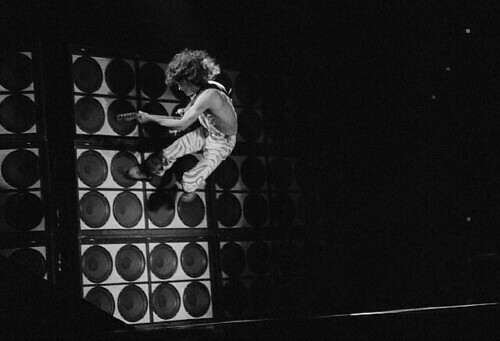 To understand more about the early Van Halen sound, one must examine the amp and effects setup that Eddie Van Halen used, not just his guitar and playing style. Eddie is a technical genius when it comes to production of sound. It is well known that Edward had a stock Marshall amplifier in the early days, although there is much confusion over the exact type and modifications of the said amp. The primary amp that Eddie used was a stock of many that he owned mid to late 1960s Marshall Superlead amplifier in the transition stage where Marshall amplifiers changed their build1. It is noted as well since Ed liked to put his amps on full blast, he used an Ohmite Variac to lower the voltage and change the sound. There are Marshall Superlead reissues out there, check them out online, eBay is a good place to start as Marshall do not sell them on their website. Another trick that Eddie used was to use a dummy load box system through the amp. Essentially this would place the effects and other additional sound modifications more directly through the amp, and adjusting the reproduction of sound effects as a result. This made the effects less noisy, and sounding more realistic as a result in terms of sound production. 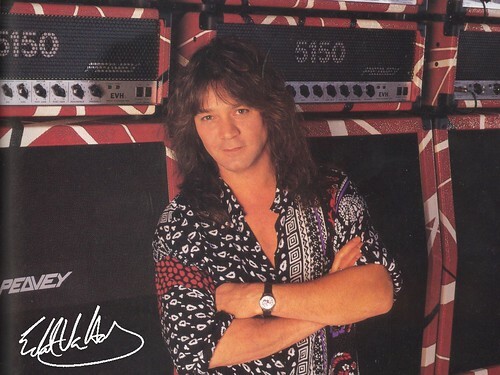 Eddie also used a couple of sixties style basket weave cabinets along with his main Superlead amplifier. This was probably to modify and contain the sound emitted from his amp. When it came to effects pedals, Ed used a fairly basic setup. He was known to use the MXR effects pedals for basic effects2 (including a MXR Flanger and Phase 90 pedal). He also used on Eruption a standard Echoplex tape delay system to achieve that sound at the end of “Eruption” on Van Halen I. His pedalboard would grow and change over the years. 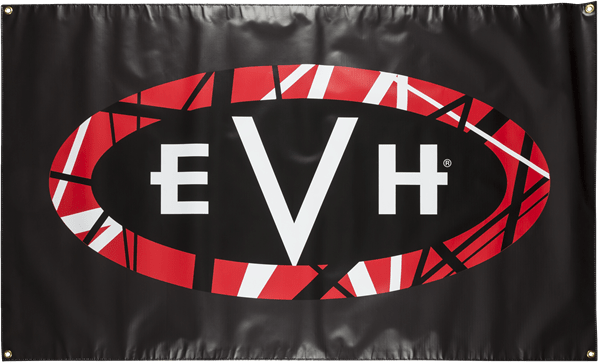 The EVH Gear website does sell some interesting pedals, amongst other things, if you cannot follow the original setup. By the way, Eddie never uses a distortion pedal, preferring instead to use the in-built distortion in the amplifier itself3. 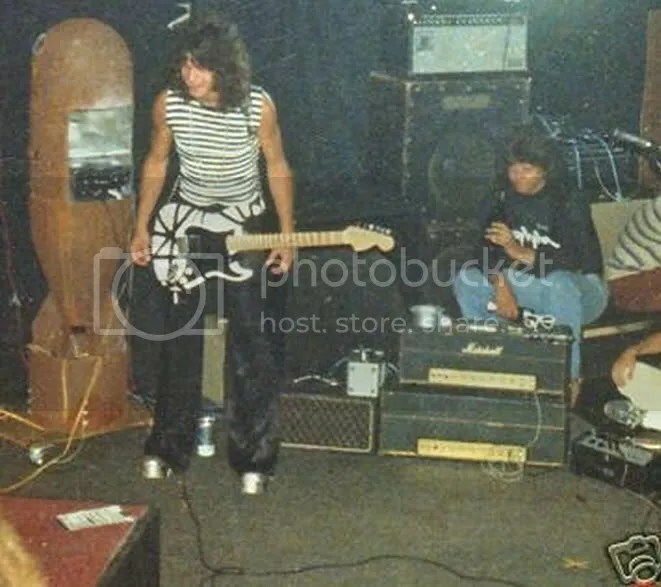 This is just a basic early setup of Eddie Van Halen’s gear. 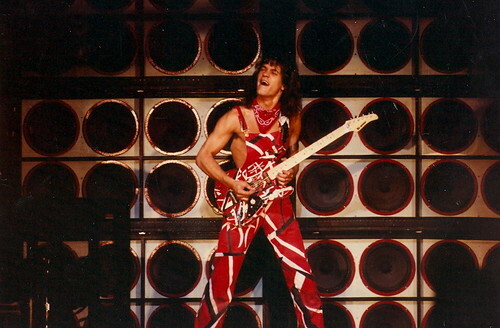 Here is a link to assist you in achieving that classic Van Halen early setup and sound: http://www.rig-talk.com/forum/viewtopic.php?t=43828 This is a link to an online forum where a more in-depth analysis of Ed’s early setup for the first Van Halen album is. The true appreciation of Eddie’s genius is not just found in his music, but also in his equipment. Additionally, below is a diagram of Eddie Van Halen’s early amp setup. The basis of his setup was fairly stock, although was slightly modified over the years. 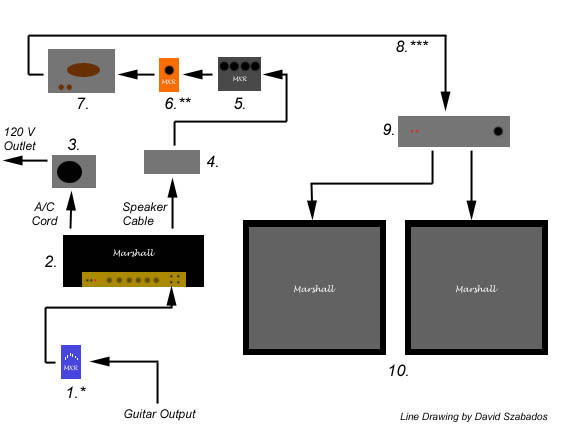 Please see the diagram below for a basic reconstruction of the setup EVH used for the main part of his career. This is a perfectly good reconstruction of how Eddie Van Halen set up his amp rig to play with on-stage, or in the studio. Marshall Superlead (late 1960s), as mentioned before, with some modifications possibly in place, although mostly stock otherwise. Ohmite Variac as mentioned before, yet set at different levels, depending upon studio/stage requirements, mostly around 89 Volts. DO NOT under any circumstances, set the voltage higher than normal, as this will damage the amplifier and possibly be dangerous to the user. Dummy load box used to deal with effects and output more easily. MXR Phase 90, sometimes Ed used this on stage, rather than linking it into the signal chain. This was totally dependent upon what song or sort of performance Ed was doing at the time. Occasionally Eddie would add an EQ box, dependent once again, on the sound and need for the output. H & H Power Amp. Please note that Eddie did initially not use this until the early 1980s. It was designed to shape the signal before reaching the speaker output. Marshall, JBL and later on, Celestion speakers used for the end output of the signal. This is a rough guide to the amp setup Eddie Van Halen used in the early days. Of course, Ed loved the sound of his Marshall amplifier, which is present on all the early David Lee Roth albums. It is a fantastic sound and is very audibly recognizable and simple to setup. This entry was posted in Guitar, Music, Rock, Technology, Van Halen and tagged Amplifier, Eddie Van Halen, Effects, Marshall, Setup, Sound, Super Lead, Variac on October 30, 2014 by chrisairey01.